Black is always in fashion, especially when it’s a piano gloss black on a Melody Hi-Fi P1688 Signature preamp and matching S88 Mono Block amps. One thing that’s sure to fire up the desire to hear music is looking at some svelte equipment, and the Melody Hi Fi tube gear is seriously nice-looking with or without its tube cages. As I put on Harvey Mason’s “Whatever It is” from his disc Ratamacue, and I enjoy the chime-like clarity to the vibraphones coupled with the clean, taut bass line, I’ll discuss the elegance of these components. And they are quite elegant, from their minimalist appearance to their built-in isolation feet. The preamp is minimalist with only three controls for power, volume and source. The S88 power amps sport a solitary power switch. All three use a low lumen lime green LED power indicator. It is a welcome relief to the eye as opposed to the laser-like blue LED’s I’ve been seeing lately. The P1688, Melody’s flagship preamp, has five pair of inputs (4 single-ended, 1 balanced) and three pair of outputs (high gain single-ended, low gain s.e., and balanced). The tube compliment of the P1688 consists of two 101D tubes for voltage stabilization, four 6SN7 tubes for signal amplification, and one 5AR4 for rectification of the DC supply. The attenuator for the level control is the DACT (Danish Audio ConnecT) CT-2, which has .5db stepped attenuation. 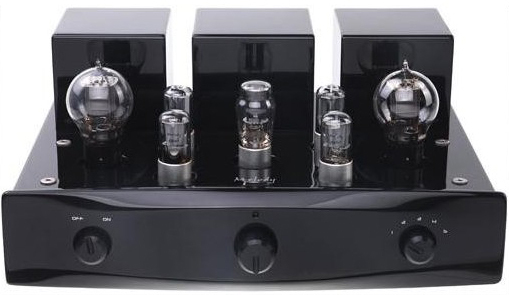 The S88 mono blocks use a pair of KT88’s and a trio of 6SN7’s. The price of the P1688 is $3,488 and the S88 mono blocks are $2,588/pr. The Low Gain output is typically used for solid-state amps, while the High Gain output is more accommodating for tube amps. Because of the dual outputs, it is possible to passively bi-amp using both outputs: a solid-state amp connected to the low gain outs for driving woofers, and a tube amp on the High Gain outs running to the mids/highs. Shipping can be rough on tube equipment and with the first preamp sent to me, a little mishandling had done its damage. The unit’s attenuator was micro-phonic – just turning the knob one step sent a low level metallic ping through the speakers. A hum in the left channel also forced me to request a replacement unit. Mingus Chu of Melody never hesitated; a new unit reached me in two days in fine shape. Mingus is the head of Melody Hi Fi, the U.S. distributor for Melody Valve Hi Fi, the Australian company which makes its components in China. Shi He Wang, the president of Melody Valve is, also, its chief engineer. He introduced the SHW-1688 preamp in Asia in 1998 where it was well received. Having refined the design by the addition of balanced inputs, audiophile grade components, point-to-point hand soldered internal wiring, and a more sleek appearance, the P1688 was introduced to the U.S. in September of 2006. It is always a treat when quality products from overseas become available to the avid listener. Audiophiles owe a deep gratitude to the intrepid owners and distributors who are working to bring components overseas as they seek to make a living from the high-end. A fully tube combo like the P1688 and S88’s quickly reveals just how rich all tube amplification can sound. I have used several fine solid-state separates and hybrids which have shown neither the clarity nor revealed as much of the music as these. As I listened to the Melody equipment, I was impressed by the uncolored presentation it provides. It is an exceptionally clear-sounding product, one which can be said as not adding a sonic signature. When I listened to it I kept getting images in my mind that it was producing the sonic equivalent of pure flowing water. The Signature preamp is very good at positioning voice and instruments in space. Case in point, Michael Hedges is known for his echoic, reverberant guitar style. While the lingering echoes of his picking sounds neat on almost any rig, the sharpness with which it is presented by the Signature is noteworthy, sounding like the acoustic equivalent of two mirrors opposite each other creating an infinitely reflected image. The ever lessening reverberations of Hedges’ guitar cascade over each other as they fade into oblivion. Listening to “The Streamlined Man” on the Pure Michael Hedges is pure joy with Von Schweikert VR-4 SR MkII speakers. Though rather large floor standing speakers, they have 93db sensitivity and were easily driven by the S88 amps. Depth of soundstage is one of the things that make the Melody combination stand out. The Hubble Space telescope has produced what’s called the “deep field” image by peering out some 10 billion light years from earth. The Melody combo seems to produce “deep field” audio right here in my room! The guitars on Acoustic Alchemy’s The Very Best of Acoustic Alchemy are quick and taut, and the acoustic reflections, although reproduced only feet away, reminded me of a crystal clear pool on a cave’s floor reflecting the ceiling above. The depth may appear to be thirty or forty feet, but is in reality about 3 feet – an amazing illusion. Similarly, the P1688 projects the depth of reverberation on the recording deep into the center of the soundstage. Hearing the Melody combo paired with the highly inefficient Eminent Technology LFT-8A planar speakers confirmed a lesser impact. Not that the ET’s are dull, but they seem to come alive with a solid-state signature in the signal. Too many tubes in the signal path and the ET’s grow very warm and enclosed-sounding, not allowing the listener to hear what the ET’s can do with the upper-end. The Melody equipment won’t sound poor on planars (I can’t imagine it sounding poor on most systems) but were born to play on highly efficient speakers, and with them they sound their best. The S88 amps are hand biased, however the manual, while stating that a voltmeter and small flat watch screwdriver are required, never states exactly how to bias the amps. I was informed that Melody Hi Fi is continuing to work on editing the U.S. manual as the product was just introduced in September this year. As some Channel Islands equipment was due to arrive in a week, I was momentarily without a solid-state preamp, so I turned to the preamp section of the Dussun V8i integrated to see how the S88’s sounded with it. In part, it was to simulate how the system would sound if the “worst possible scenario” was realized, that of a solid-state integrated’s pre being joined with the more limited tube power of the 50w S88’s. The result was surprisingly good. While the “eternal echo” effect was not as strong, the presentation was clean and tight. The Eminent Technologies LFT-8A’s perked up with the solid-state preamp. Their slightly rolled-off high-end benefited from a few less tubes in the signal path. I thought that the S88’s might run out of steam pushing the ET’s, but they showed no signs of hardship with the hybrid planars. It is hard to make a mistake with the S88 amps. I consider them even more bang for the buck than the P1688. They mated well with the Dussun’s preamp out, which bodes very well for them to be used with a dedicated solid-state pre. I found that they did not produce tremendous amounts of heat, a further plus. However, it should be reinforced that the Melody Signature and the Dussun V8i both performed most admirably within their own boundaries, when running together. Digital amps have become quite popular for their melding of seemingly limitless power and diminutive mass. I’ll compare the sound of the P1688 to the digital set-up of the Channel Islands PLC-1 passive preamp and D-200 mono block amplifiers.